Doing some quick math, if you're doing 43 mph with a 6.34 ratio, you'd need a 4.50 rear to do 60 mph (4.54 technically, but if I recall, Mack made a 4.50 rear that went into some of the Bs with the direct-drive duplex). I'm guessing you have a single-over triplex with final drive ratio of .85. On standard rubber that would give you about 47 mph at 2100, pretty close to the 43 mph you mention. I would think that you have enough power pull a dozer at 60 mph with the ENDT and a 4.50 rear, at least on flat ground. I once drove a single-axle R model with an END 673 (no turbo), single-over triplex, and 4.14 rear pulling single-axle trailers with maybe a 10-12,000 pound payload, and it would run about 70 until it hit a hill. Unless I'm mistaken, and I often am, Mack never made a B52. Maybe confusing it with the bomber? http://cgi.ebay.com/ebaymotors/Old-B-52-Mack-Diesel-Truck-/121052280184?pt=Commercial_Trucks&hash=item1c2f473578 For money, an interesting project...but way too far away for me. OK, let me see if I can scan and get the build record to you in the next couple of days. The copy I have is hard to read in some places (it's already a copy of a 45 year old piece of paper), but I think I can scan it and get it to you. Enjoy the truck. I've enjoyed tinkering on mine. Be happy to send it -- what's the best way to get it to you? Ah, sure enough! You can clearly see the corner of the magnet peeled away in the eBay picture. I was so busy looking at everything else I missed what was in plain sight. Good eyes! 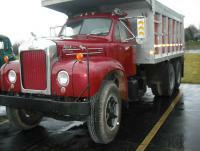 There's one for sale right now on eBay: http://cgi.ebay.com/ebaymotors/1961-Mack-B-73-/221117280822?pt=Commercial_Trucks&hash=item337b9df236 It sure looks like the same truck, except the name on the door is different. And the towns where they are for sale (Janesville and Whitewater) are different, but the towns aren't more than 15 miles apart. It's got to be the same truck. Can't explain the different name on the door in the two sets of pictures. Pretty sure the one with the Pope name on the door was for sale earlier this year. The price was somewhere around $17K back then too. Does seem a bit pricey. Right, I didn't say that right. Nothing's wrong with the turbo set-up itself, but the air cleaner is mounted awfully funny. Maybe you could get away with that on a mixer, but hard to see how it works for anything else. On and off, that one's been for sale on craigslist for a while -- all the way back to last year if I remember. Wish I was closer to go look at at. I too want a single axle with a triplex, though I'd prefer a B61. Saw one around here but for a lot more money with a rough cab and engine. So this seems like a good buy if it's in decent shape. That turbo on the 711 must have been the after-market one Mack sold? I've heard of 711s with a turbo but never seen one. A 4.11 rear and a single axle for a B75 with a triplex seems a bit odd; wonder if the rear end is also a more recent swap. Interesting truck! I think a drove a 14 speed quad box on a gas engine dump one night many years ago. Ran it from one end of a yard to another dumping snow, so I never went through all the gears. From what I recall vaguely and from what I remember others saying, I believe that the 14-speed quad box was geared down slightly from the standard 13 speed quad box. The 13 speed quad has two overdrive gears (4th hi and 5th hi, with direct in 4th direct). As I recall, the 14 speed was geared so 4th hi was direct and there was only the one overdrive gear (5th hi). So it didn't shift any different than a standard quad box -- the 14th speed was the lo-lo hole in first, but the standard quad box had that too. They called it a 14-speed just to distinguish it from the standard double-overdrive 13 speed quad boxes. The 14 speed tended to be put into trucks like dumps or mixers where you often did use the lo-lo, so you'd use 14 gears (lo-lo plus the standard 13). I'm thinking it was a TRQ 770 or maybe a TRQ 72, but my memory, like my eyes, is getting fuzzy. At least that's how I remember it. Just had my B61 with the quad box out this morning. Beautiful day for a drive. Whose gonna buy the 57 and 59 Integral sleepr B models on Ebay? If these are the same trucks, and I'm pretty sure they are, they went at a big antique car and truck auction in July in central Pennsylvania, right off I-80. I was running across there the next day but couldn't arrange things to make the auction. I called the next week and the auctioneer told me both sold. I saw the price sheets for the auction and each went for $7,000. I like 'em more factory correct, but for that price...I'd have bought them both if I had the money!